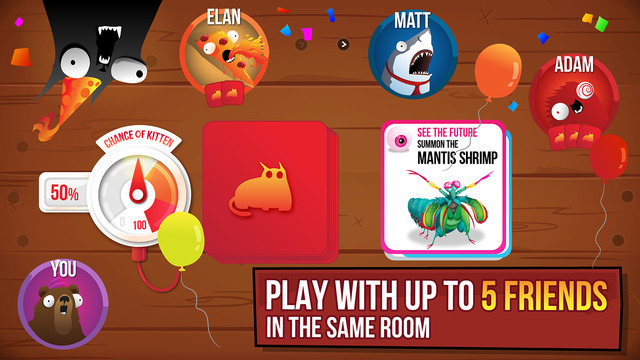 I seriously adore cats, so it’s funny that I’m actually even remotely interested in a game with the title Exploding Kittens ($1.99). 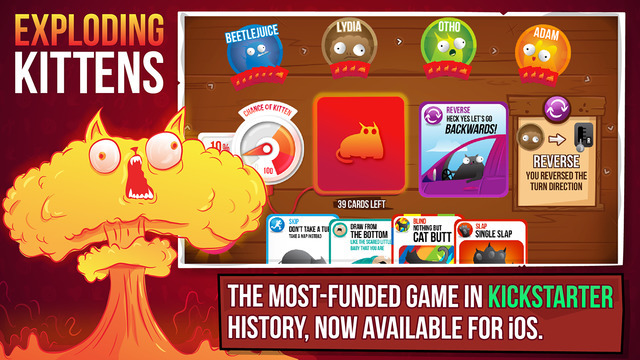 Yet, Exploding Kittens, which has just popped up on the App Store, isn’t just any game; it’s the digital version of (and I’m sure you’ve heard this line before) the most-backed game in Kickstarter history and the campaign with the most number of backers, ever. Not an insignificant praise given the competition and considering that Exploding Kittens is a card game all about trying not to draw an Exploding Kitten card. If you do, you die, and you’re out of the game, unless you have a defuse card that allows you to defuse that poor Exploding Kitten using laser pointers, belly rubs, and catnip sandwiches (my cat would love the latter one). All other cards in the deck simply help you move, mitigate, or avoid the Exploding Kitten. So, as you can tell, not the most complicated or strategic card game ever, and that’s fine because that’s not what the people buying it are looking for. As the website describes it, Exploding Kittens is simply a kitty-powered version of Russian Roulette. What makes the game stand out – outside its cat theme – is the wonderful art by The Oatmeal (Matthew Inman) and the game’s humorous tone. People looking for a cute but slightly-offensive card game flocked to the Kickstarter campaign and turned Exploding Kittens into a phenomenon. Now, the digital version is…interesting in its execution. The game does look great judging from the screenshots, and everything that makes the game fun seem to have made its way to the iPhone app. It even has new cards exclusive to the digital version. However, the game is multiplayer only and – at least at launch – the game offers only Bluetooth/WLAN multiplayer; in other words, if you aren’t in the same room with the rest of the players, no kitties will ever explode. This is an interesting port in the sense it’s really just a digital extension of the physical game which you can play without owning the physical cards rather than one that takes advantage of mobile’s multiplayer possibilities. I’m not aware of future plans to include online multiplayer, but I’m definitely keeping an ear out because as it stands, I see very few people being able to enjoy the game. The game is iPhone only and it costs $1.99, and as a launch special, all the IAPs are free. So, if you have people to play with, go grab it and (sniff) explode some kittens.